This soup is the perfect thing to eat in March. It’s not quite full swing for spring vegetables and I haven’t fully moved on from winter root vegetables. Carrots always remind me of Easter as well. I am so ready for it to be spring! This winter has been very cold and snowy for so many, ourselves included. I love seasons, but the end of winter really has a tendency to drag on. That being said this carrot soup warmed us up on a snowy March day. And that bright orange color makes me swoon! This soup is so easy, but absolutely delicious. It has simple flavors and ingredients done right, which is my favorite kind of recipe. The ginger flavor isn’t overpowering at all and it was great for my 2-year-old. It seems like I always have extra carrots laying around my fridge. This is a great recipe for using them up! I like making soups like this at the beginning of the week and having them in my fridge for lunch or a snack throughout the week. The outcome of this soup is highly dependent on a quality vegetable or chicken stock. Homemade stock is always the best option. If you don’t have that just make sure you don’t use one that is high in sodium, or you will have a very salty soup! We served this for dinner with a chickpea flatbread and a simple salad and it was heavenly. I hope you enjoy it as much as we did! A delicious and easy way to use up carrots! My toddler loves this. Preheat the oven to 400F. Toss the chopped carrots with 1 1/2 tablespoons olive oil and sprinkle generously with salt and pepper, about 1/2 teaspoon each. Roast the carrots for 25-30 minutes, until fork tender. Meanwhile, heat 2 tablespoons olive oil in a large pot over medium-high heat. Add the onion and saute for 4-5 minutes, until softened. Add the garlic and cook for 30 seconds, until fragrant. Add the stock, ginger, and thyme and bring to a boil. Reduce to a simmer and continue to cook for about 20 minutes, until the carrots are done roasting. Add the roasted carrots to the broth and continue to cook for 10 minutes. Remove the ginger and thyme spriggs. Puree the soup with an immersion or standard blender until smooth. Season to taste with salt and pepper. Enjoy! The ads on your page that constantly replay (despite my attempts to mute) have turned me off from your page. I can’t even finish this recipe on your site, I’m constantly having to pause Netflix to mute the ads on your page that restart every few seconds. Just a heads up. Made this three times now – leaving in the ginger for its gentle kick. Delish! Wanted to say how much we loved this delicious soup. 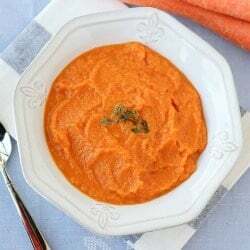 Thank you for such an awesome and easy Carrot Soup recipe! The recipe sounds delicious. I wanted to check if one could roast all the ingredients including the onion garlic and thyme and then just add the fresh ginger to purée?